"We knew it was alternative finance we had to look at. Pension-led funding made perfect sense to me." Renewable energy specialists Solec have ensured a sunny outlook for their business by staying one step ahead of the game. Solec started installing heat pumps three years ago as a way of surviving the solar crash. Surviving not one, but two cuts in solar power subsidies by the Government, Solec now has doubled the size of their order book. They have also given something back to the community by installing a new 10kw Solar Array on a new sports pavilion – for free. 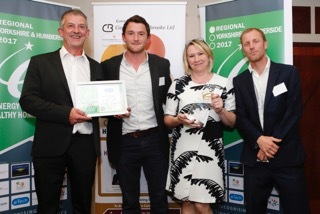 Solec were recently crowned Renewable Heat Incentive installer of the year in the Regional Energy Efficiency Awards and also commended as Solar PV Installer of Year. A remarkable turnaround, achieved in part following an injection of finance secured using Pension-led funding which “took our business to the next level”, said Gaye Wilmot, who runs Solec with her husband Robert, in Horsforth, Leeds. Solec has come a long way from the electrical contractors who spotted the commercial opportunity of installing Solar PV Arrays which were backed by generous coalition Government grants. That was until the Government decided to slash the subsidies in half within a month back in 2012 and when the axe fell again in 2015 it had a massive impact on the renewables industry. From a peak of more than 5000 Microgeneration Certification Scheme (MCS) accredited Solar installers in the UK this plummeted to 2,500 within a year of the 2016 Government cuts and now there are only 1,850. With cash flow reaching “crisis point”, Gaye and Robert feared Solec wouldn’t survive. Gaye said: “The kit is very expensive. Heat pumps, solar panels, converters, they are pricey – 70% of what we charge. “We had run out of our own resources without putting the house on the line. Although the bank was incredibly supportive, they couldn’t actually loan us anything because our turnover had dropped considerably. “We knew it was alternative finance we had to look at. Pension-led funding made perfect sense to me. My accountant told me why I shouldn’t be doing it. “We spoke to a couple of Pension-led funding customers and they said: ‘Absolutely brilliant, the best thing we have done’,” Gaye said. With the help of Pension-led funding, Robert and Gaye gave their business a vital £30,000 injection of pension cash. Their existing pension pots were transferred into two Self-Invested Personal Pensions (SIPP) set up by us and used to purchase preference shares in Solec Energy Solutions Limited. The shares will be redeemable over a five-year term with a 12% coupon being paid back into Robert and Gaye’s pension schemes. Robert and Gaye are big believers in the renewables and highlight the potential of heat pumps to provide an efficient alternative to oil heating in areas where there is no mains gas supply. The possibility to give something sustainable back to the community proved irresistible during the construction of Horsforth Sports Club. “Robert said ‘why not put solar on it? And we’ll do it for nothing’. The club gets free daytime electricity and we get the feed in tariffs,” Gaye said. “The system is generating way in excess of what we hoped, it contributed over 10,000 kw hours towards their bill last year.